The moment Nelson Mandela really became Nelson Mandela was on April 20th, 1964 – fifty years ago today. It happened when he stood up in a stuffy South African courtroom and gave a speech. 50 years is a long time. It’s long enough for things to become history. Long enough that people start to be forgotten, stories get smoothed over, narratives get hardened in stone. That’s what happened this past December with the death of Nelson Mandela. His life story was written… in sharpie. Listen to our new podcast: “I am prepared to die.” And the 10-thousand other words that nobody remembers. 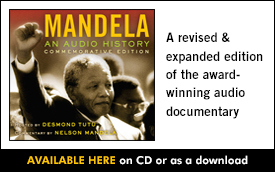 This episode features one chapter from Mandela: An Audio History. You can purchase a new CD with the entire series here. The Radio Diaries podcast is part of Radiotopia from PRX. Subscribe to the podcast in iTunes.